This is one of those books I can’t believe I never read when I was younger. 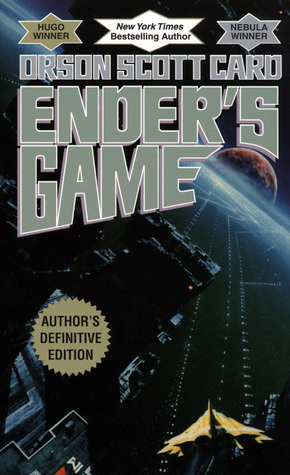 Fascinating from the start, but with a life changing story and morals, Orson Scott Card outdid himself with Ender’s Game. It’s fascinating how he manages to blend youth and age seamlessly. While Ender starts at only six and when he becomes the commander, he’s only eleven, the person you follow is wise beyond his years and the juxtaposition between following an adult mentality versus the occasional childlike things he does or says is jarring. The futuristic world is so cleverly created and integrated into the story line and Ender’s story, as he’s manipulated, used on whim and eventually rises above it, is a timeless tale. Genius or Killer #1: The first time we meet Ender he’s getting the monitor removed, which means that no one’s watching him to keep the bullies at bay. From the outset, we see how Ender reacts, how he calculates the best possible way to be left alone and then deals with Stilson in the schoolyard. This mode of thinking, them against me, follows him throughout battle school and is the reason he’s recruited in the first place. From an early point, they can see that while he cares about people and doesn’t want to hurt anyone, when backed into a corner he’ll make the harsh decisions. Heavy foreshadowing of what’s to come. Bravo, Orson Scott Card. Genius or Killer #2: Ender after being isolated at Battle School continues excelling despite all the hurdles thrown his way, despite all the antagonism from his peers. The teachers are completely unfair to him, throwing him into battle simulations early, throwing him on a team where the commander, Bonzo, hates him. Yet when Ender ends up as a commander, he wipes the board, every single time. His team becomes unbeatable to the envy and hatred of many in the school. Others decide to learn from him, to get better, but Bonzo, his original team leader hates him for it and wants to kill him. The confrontation reaches a peak when Bonzo gangs up on him, just like Stilson in the beginning and Ender reacts the same way when backed into a corner, making the hard choices and using wits over brawn. However, the teachers don’t reveal that Bonzo was sent home in a bodybag, nor that Stilson was his first kill. Genius or Killer #3: This is the big one, the gamechanger of the story where everything got turned over onto its head. These officers and teachers have been priming Ender for command, making his life a living hell. Finally in command school, Mazer Rackham, his teacher, runs him through countless simulations against the buggers while Ender commands all of his old friends from Battle school. Game after game after game until Ender’s burnt out and wasted. Finally, the graduation test is sprung on him with no chance to prepare. And the odds are impossible. So Ender decides to stop playing their games and takes out the whole planet with the bombs rather than worrying about the onslaught of fleets, destroying the imaginary bugger homeworld in the process. Except Ender finds out it wasn’t a game and that all of the simulations in Command School were real battles against the buggers. And he just annihilated another race. This was the crescendo of the book, the breaking point for Ender. But he finds and communicates with a remaining bugger after a time and spreads a message of peace, reversing the damage he’d unintentionally done. Orson Scott Card’s brilliant book leaves you with the duality of humankind that lives in all of us, the constant struggle of empathy and anger, but to which one wins out depends on each individual. Haven’t read it? Add it on Goodreads!